Get ready for an unforgettable adventure! The Altar volcano (5.320 m) located in the Sangay National Park, is an extincted volcano shaped like a horseshoe after an immense eruption. The volcano is open on one side, its very sharp peaks reaching high up into the sky on the other-a truly amazing scene! The vertical walls of the volcano are covered with glaciers which hang from them. 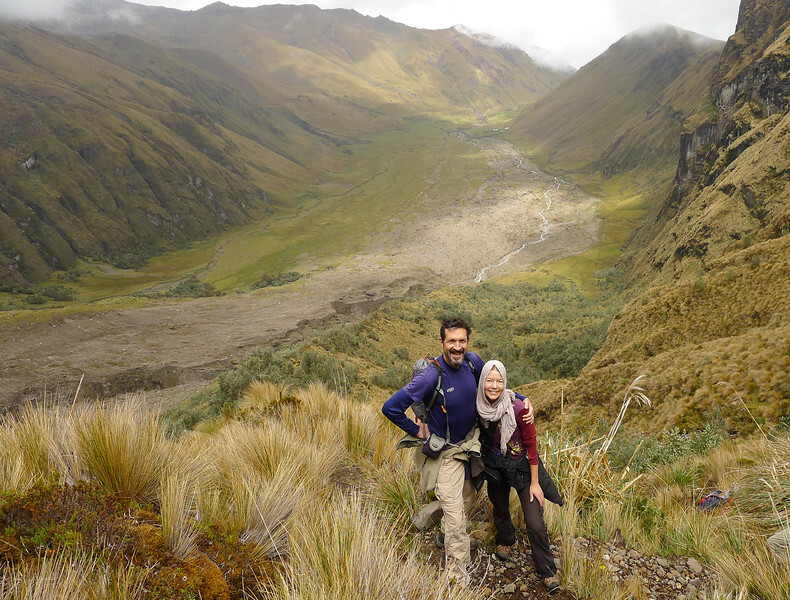 The wild and untouched nature around the Altar volcano is one of the most impressive regions for trekking in Ecuador! Pay a little more for the extra comfort or go local and try our 3 day program. Departure at 8am from Quito with private transport. You head south for about 5 hours to a place called Releche, east of Riobamba at the slopes of the Altar Volcano at 3000 m. Dinner and rest in a cosy hacienda. After breakfast you get ready and prepare all the climbing equipment. You will climb uphill and we will pass fields and varying vegetation of the Andean Grasslands until you reach the Camp Collana at 3800 m after a 5 to 6 hours hike. After setting up the camp you can enjoy the wonderful view at the Altar mountain ridge. Dinner and rest in the camp. After breakfast you continue walking around a crater called the green lagoon at 4400m for about 5 or 6 hours. During this climbing tour you will partly be walking along the steep edges of the crater from which you will have a wonderful view inside. After a break at the shore of the lake you will continue our walk to the highest point (4.480 m). From there you will have a breathtaking view over the extinct volcano. In the afternoon you will return to the camp in the Collanes. There you have dinner and rest in the camp. After breakfast you get your things packed and return to Releche. There the transport is waiting for you to bring you either back to Quito or to Baños.